In Tal-Kaif’s military prison, north of Mosul, a 35-year-old local man is currently awaiting trial. For the last 3 months of ISIS’ existence, he worked for them for 5000 Iraqi Dinar per day (almost £3) as he had run out of food for his family. In the Kurdistan Region of Iraq (KRI), more than 1.2 million people (one fourth of the region’s population) receive their salaries four months behind regular payment schedule, with wages having already been slashed by half. Their situation is not yet dire, but could become so in several months if the situation does not change. The Kurdistan Regional Government (KRG) is not in the position to pay them; after losing more than half of its oil revenue in October 2017, when the Iraqi federal government took back Kirkuk’s oil fields. Private sector jobs in the region decreased by 90 percent, from 730,000 jobs in 2013 to just under 73,000 in 2017. Neither has the federal government provided any viable solution. Both governments’ leaders have offered only unfulfilled promises. The KRG could not prevent Iraqi parliament from reducing its expected national budget share from the usual 17 percent to under 13 percent. The budget share has, in any case, not been delivered since 2014. Now, the region is left with three options, none looking like a feasible solution to the current crisis. Firstly, it could reach an agreement with Baghdad and return to the pre-2013 status quo, before it started exporting oil independently. Secondly, it could hold the course and keep selling oil. Thirdly, it could compromise with Baghdad and sell more oil than its listed production rate (250,000 bpd) based on the Iraqi budget, to pay back its debt. Some simple calculations show that the KRG’s independence policy was not, in the first place, economically viable. The region’s annual budget (its 17% of the national budget share) was three times bigger than what it could expect by exporting oil independently. In 2014, the KRG’s oil revenue was about $2.3 billion, while its 17% national budget share was about $7 billion (including federal expenditures). Iraq’s Prime Minister at the time, Nuri Al-Maliki, cut the KRI’s share of the national budget entirely, leading to economic hardship in the region and a significant loss of income for one quarter of the population. At the time, 70% of the region’s public expenditure went to the government payroll. Responding to this budget cut, KRG slashed its payroll by nearly half. The war with ISIS also gave it the opportunity to annex two key oil fields in Kirkuk (Havana and Bi Hassan), which increased its oil export potential from approximately 300,000 to 600,000 bpd. Despite these measures, it never paid public employees’ salaries on time; therefore, the region has faced huge protests and civil disturbance. Last December, the KRG deployed tanks and Humvees on the streets to prevent protestors from burning political parties’ offices and some government institutions. As with any oil-dependent Middle Eastern economy, economic independence meant selling oil independently from Iraq. The KRG planned to expand its oil sector and successfully brought several international oil companies to the region. This resulted in dozens of billion-dollar contracts’ worth of investment. However, bad governance, corruption, the oil price slump, and ISIS’ war indebted the region and brought it back to seeking pre-2013 relations with Baghdad. Now, the KRG is trying to hand over its oil sector to Iraq if the latter will pay back the region’s debt. On the other side, Baghdad does not want to inherit the region’s almost $20 billion debt, but does want to take back the oil. Several longstanding disputes led to the current crisis between Baghdad and the KRI. The federal government has long considered the KRG’s deals with international oil companies illegal. As such it rejects any obligation to pay outstanding amounts owed to these companies, and has demanded that the KRG hand over its produced oil to the federal oil marketing company (SOMO). Each side interprets oil-related constitutional articles differently, and these differences have prevented them from codifying (through a national hydrocarbons law) constitutional issues on resource-sharing between the federal and regional governments. Furthermore, Baghdad has never paid into the budget to pay the salaries of Peshmerga forces as part of the Iraqi armed forces or as the KRG’s regional guards. Both sides have also not solved their historical rivalry over the disputed areas (including the oil-rich city of Kirkuk). Consequently the disputes escalated and each side followed its own path. The KRG kept selling its oil independently, and Baghdad has never paid back the region’s 17% budget share. In 2015 and 2016, there were some practical agreements over Kirkuk’s oil and security cooperation in the fight against their common enemy, ISIS. However, none of the agreements lasted. Kurdistan’s independence referendum further complicated relations and reset the equation in favour of Baghdad. The federal government restored its authority over Kirkuk’s oil fields, with the KRG thus losing more than 50% of its oil revenue on 16 October 2017. The KRI’s key problem is not just mismanagement of its oil sector, but the region’s poor governance. The ruling parties, Masoud Barzani’s Kurdistan Democratic Party (KDP) and the late Jalal Talabani’s Patriotic Union of Kurdistan (PUK), did not build strong governmental institutions or diversify the economy in anticipation of independence, instead using the rhetoric of the generations-old Kurdish dream of independence for their internal political gain. The region’s ex-president Masoud Barzani’s autocratic ambitions – including overstaying his presidential term by two years – halted the region’s parliament, when his armed forces prevented the Speaker Yussef Mohammed from attending the parliament building in Erbil for more than two years. The KRG is not currently financially sustainable as its oil exports (about 305,000 bpd as of February 2017) are not enough to cover its expenditures. Even retrieving its national budget share, in exchange for handing over the region’s oil to Baghdad, would not be enough to sustain expenditures, according to the KRG’s Prime Minister Nechirvan Barzani. Meanwhile, officials in the federal government have no inclusive policy with which to resolve the disputes, instead preferring to take advantage of the KRG’s weak leadership and position. Showing scant interest in pursuing a sustainable solution, after they restored federal control over Kirkuk Iraqi officials tried to persuade the Turkish government to transfer authority over the oil exports at Ceyhan Port from the KRG to the federal government. Turkish officials indicated that they were willing to do so only in exchange for a settlement of the arbitration. Despite visible disputes, both the KRG and the Iraqi federal government still need each other. Iraq needs the KRG’s pipeline to export Kirkuk’s oil. It cannot implement its deal with the Iranians to transport the oil via truck to Iran’s refineries due to ISIS’ continuing insurgency. 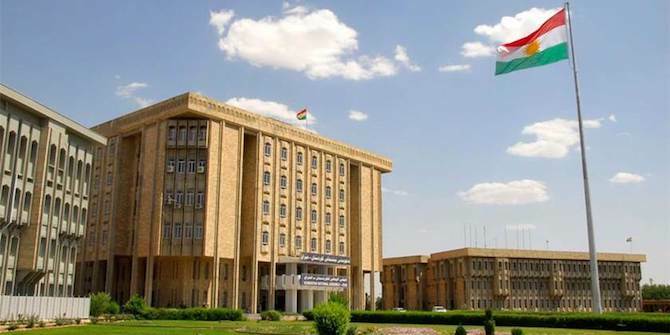 Moreover, the KRG needs access once again to its share of the national budget. As Iraq’s May election is approaching, politics looks set to prove to each side their mutual dependency. PM Abadi will have difficulty getting re-elected without some Kurdish support in the post-election parliament. The KRG’s ruling parties will not be able to protect their vote shares if they cannot find a quick solution to the region’s economic hardship. Both governments should approach disputed Kirkuk as holding potential to develop a sustainable partnership rather than further disputes. They should expand the agreed-upon deal to supply KRG-linked refineries Bazyan and Kalak with Kirkuk’s oil in exchange for refined products and electricity. Expanding upon such a deal to form a comprehensive partnership has strongly support internationally, including institutions like the IMF and the World Bank. This is part of the proceedings of a workshop on Iraq and its Regions: The Future of the Kurdistan Region of Iraq after the Referendum, held at the LSE on 16 March 2018. See below for the full list of papers. This piece was also published in Kurdish for the Iraqi newspaper Awene, and can be read here. Bad Behavior has blocked 366 access attempts in the last 7 days.